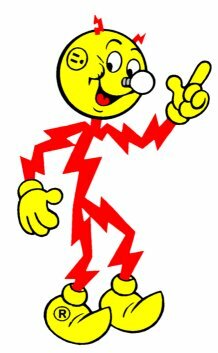 Reddy Kilowatt, where are you now? Honestly, it was like living in the 18th century…when the big, fast-moving storm system blew through last nigh around 8:15, it didn’t take long for our power to go out. For living in a supposedly affluent suburban area we have a lot of electric power interruptions. This one apparently involved the transformer and switching box (at least that’s what it looks like it is) a couple of hundred yards west of our house. It was difficult to see because the golf course lets that area of the fence get pretty overgrown so folks along Ogden Avenue don’t gawk at the bad plaid pants. Even going across Ogden didn’t give us much of a view except for the brilliant flashes of orange, and later white, light; accompanying smoke; and a low-pitched hum accompanying each flash. Maybe it was a high-voltage line to the transformer this time. A couple of years ago the transformer itself was struck by lightning. That was a pretty impressive sound and light show from our bedroom window! It took three days for ComEd to replace the transformer – and this was, of course, in the middle of a very warm party of July. Today the temps are only in the low 70s, but it’s been windy all day and we’ve had intermittent showers. According to the radio news there were about 300,000 ComEd customers left without power last night. They said it could take a couple of days for the more than 400 work crews to get everyone hooked back up. I consider us fortunate. We had winds in excess of 70 mph according to measurements made in Naperville, and we probably got over two inches of rain in a hour. It’s not just electricity for air conditioning, lights, and refrigeration; we have a split-level house with an electrically-operated sewer lift pump. That means the usage of toilets during the no-power interval is “limited”…so we’re glad the power is back for very important reasons, not just because we missed the second half of “White Collar”! You are currently browsing the The Old Gray Cat blog archives for the day Wednesday, June 22nd, 2011.